Lauryn Sargent of Stories Incorporated teaches us how to interview employees to get the best stories about our company’s values, culture and purpose. As an expert in employee storytelling, Lauryn has created over 1,000 employee stories! 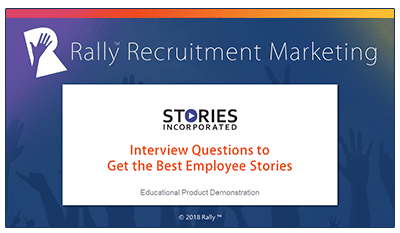 She shares what to ask, what NOT to ask, where you can use employee stories to attract top talent and the benefits of working with a recruitment marketing content agency like Stories Incorporated. Length: 30 minutes.